What the Heck is “Mise En Place”? Listeners of the podcast may recall that I completed the Forks Over Knives Online Cooking course earlier this year. If you haven’t checked out my review of the course, you can hear it in Episode 274: 5 Big Take-Aways from the Forks Over Knives Cooking Course. One of the big takeaways I mention in my review is the concept of “mise en place,” a French phrase that means “putting in place” or “everything in its place.” The concept of mise en place entails pre-measuring ingredients, chopping vegetables, and organizing your cooking workspace so that you are ready to prepare your food. Mise en place is a valuable practice for both professional chefs and home cooks alike. What is the purpose of mise en place? The purpose of the chef’s mise en place is to help him/her be more efficient in the kitchen. If you’ve ever worked in or even seen a professional kitchen you know how crazy it can get, which makes efficiency and organization key. But mise en place is more than just “ingredient prep”. As I learned in the Forks Over Knives course, it’s a mindset that isn’t just for professional chefs. Why is Mise En Place Important? Most of us have experienced the frustration of discovering that you are out of one critical ingredient when you’ve already started cooking. Having all of your ingredients prepped and ready to go before cooking helps prevent this from happening to you. When I was learning how to cook the Forks Over Knives way, I was learning many new concepts and recipes. The last thing I needed to do was to be running back and forth to the cutting board or pantry trying to get what I needed next. Another critical piece of mise en place is to clean as you work. As water is boiling or ingredients are cooking, you can start to tidy up your kitchen. This not only helps prevent cross-contamination but also helps with the post-meal cleanup. when dealing with a crisis situation. While chopping, prepping, and organizing ahead of cooking can seem a bit slow in the beginning, the efficiency you gain by having all of your ingredients and cookware in place ahead of time is well worth the effort. I love to find connections between topics that I find interesting, and cooking and productivity are two topics I find very interesting! When I first learned about the concept of mise en place in my cooking class, it really resonated with me, perhaps because in my former corporate life I managed project managers. In the corporate environment, one would never dream of launching into a project without a certain degree of planning. Granted, the level of planning needed to fit the size and complexity of the project, but there was always some degree of planning involved. Planning is critical to successful project management because it help to ensure the objectives of the project are met with a high degree of quality. To work “clean” means to spend some time planning (ideally 30 minutes a day according to Charnas) to ensure that you are working on the “right” things during your day. 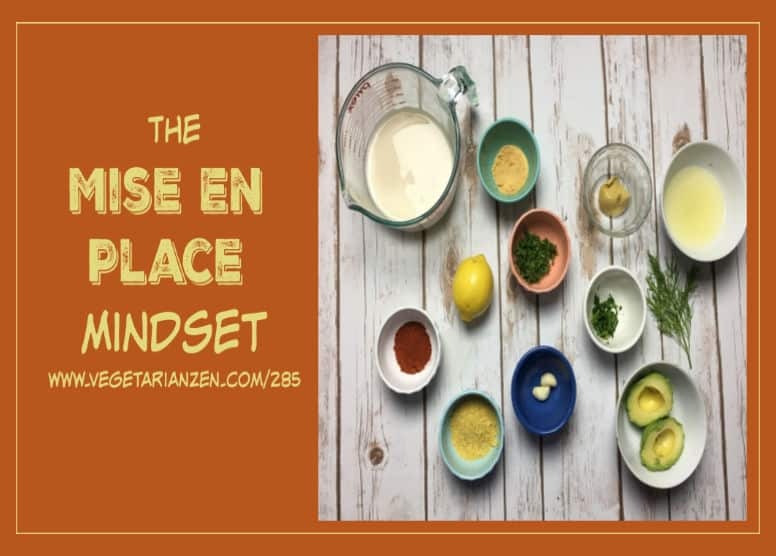 Is the mise en place mindset something you incorporate in your kitchen and in your life? Our Cinnamon Sugar Roasted Chickpeas!